Google Translate is the most popular site and app in the world for translation, and I thought it would be useful — both for readers and for my Theory of Knowledge students — to bring together some resources to learn how it works. How Google Translate works is from The Independent. How Google Translate Works Its Magic is from Read Write Web. Worlds Unknown: The Regions Ignored by Google Translate is from The Atlantic. Introducing Translate for Animals (beta): Bridging the gap between animals and humans was a funny April Fool’s Day prank Google pulled one year. The Cold War Origins Of Google Translate is from the BBC and is pretty interesting. The final data reveals that while Google Translate is widely preferred when translating long passages, Microsoft Bing Translator and Yahoo Babelfish often produce better translations for phrases below 140 characters. The New York Times published a chart titled “Putting Google to the Test in Translation.” In it, they compare several pieces of text using Google Translate, Yahoo’s Babel Fish, and Microsoft’s Bing translation system. Google seemed to come out on top. Doc Translator says it “Instantly translates and preserves the layout of Office documents using the Google Translate.”It could be a useful tool for times like when my ESL students wrote informational fliers for their neighborhoods when the H1N1 flu first hit. They can put their energy into writing a document in English, make it into a nice flier, use Doc Translator to translate it (and maybe tidy it up a bit), and then upload it to the web. 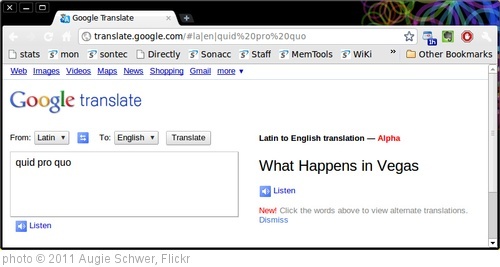 Google Translate Adds Example Sentences To Put Words Into Context is from TechCrunch. Microsoft’s Chief Research Officer gave a pretty amazing demonstration of computer translation advancement. You can watch the entire video here). He speaks English and, just seconds later, what he says is translated into Mandarin in his own voice. You can read more about this advance, including a history of machine translation, at his post. Lost in Translation? Try a Google App is from The New York Times. Google Wants To Improve Its Translations Through Crowdsourcing is from TechCrunch. Making Use Of Google Translate offers some intriguing thoughts for ESL teachers. Google will soon announce updates to its translation app for phones. Google Translate now offers written translation of 90 languages and the ability to hear spoken translations of a few popular languages. In the update, the app will automatically recognize if someone is speaking a popular language and automatically turn it into written text. Is Translation an Art or a Math Problem? is from The NY Times. Could the language barrier actually fall within the next 10 years? is from The Conversation. TOOL REVIEW: GOOGLE’S TRANSLATE FEATURE RULES. is by Bill Ferriter. Google Translate has made some new advances. Read about them at these two TechCrunch posts: Google’s smarter, A.I.-powered translation system expands to more languages and Google makes its local reviews easier to use when traveling with automated translation. Translation platforms cannot replace humans is from The Economist. Microsoft’s Presentation Translator translates presentations in real time is from TechCrunch. Super-Brainy Translation Tools Mean Language Barriers Are Falling Fast is from NBC News. This earpiece can translate foreign languages in seconds is from Wired. M is for Machine translation is by Scott Thornbury. The Coolest Thing I Saw at BETT Today! is a post by Richard Byrne where he gives an update on the Microsoft Translator. How to Use Microsoft Translator is from Richard Byrne. The Shallowness of Google Translate is from The Atlantic. Waverly Labs offers real-time translation with its Pilot earbuds is from TechCrunch. Microsoft announces breakthrough in Chinese-to-English machine translation is a TechCrunch post. You can try out their new new tool here. Lost in translation? Try interpreter mode with the Google Assistant is from Google. I see Google Translate a tool useful to those who have at least some command of their L1 language (spoken and /or written). Would you agree and/or have any Google Translate-related advice for the US-born ELs who have very little or no command of their L1? Thank you! Once students begin to develop some basic skills, I discourage its use in writing.